Cryptocoins are not made of metal like the ones in the photo. They are entries in a distributed digital ledger called a block chain. I put up a “tip jar” to accept gifts of 4 different kinds of cryptocurrencies on our missionary partner page, but that doesn’t actually mean that I think investing in cryptocurrencies is a good idea. I don’t know. I am, however, happy to receive gifts of cryptocurrencies to help support our ministry if anyone wants to give them. The cryptocurrency that gets the most press, Bitcoin (the classic original one), is actually useful, should I get some, in that I can spend it directly for some services I need for ministry. The other 3 (Bitcoin cash, Etherium, and Monero) have some technical merit over Bitcoin classic, but nowhere near the popularity. I would likely have to convert them to another form of money to use them. Popularity is essential for any fiat currency to have actual value, since, like almost all national currencies, it isn’t actually backed by anything but the word and reputation of the issuer. In this case, the issuer is a distributed network of cryptocurrency activists with simple majority rule in their ranks. The issuers are vulnerable to a multitude of social and technical attacks that could cause losses, or in some severe cases, bring the system down. Of course, national currencies are also subject to many such attacks, but the national governments actively defend against counterfeit currency and attacks on the banking system. Block chain cryptocurrencies are actually less vulnerable to some attacks than national currencies. Nevertheless, they are starting to look more like the same thing to an attacker. The difference is that national currencies are kept in computer banking ledgers in central systems, while cryptocurrencies are kept in distributed ledgers in a loosely associated “block chain” network of computers all over the world in such large numbers that it is hard to take them all down if the particular cryptocurrency is popular enough. I’m thinking that it may be easier to attack the centralized bank ledgers than the decentralized block chain ledgers, but I’m not interested in doing either, so I haven’t really studied the matter. In the picture, above, there are only 9 coins that I can use as money where I am right now in space and time. 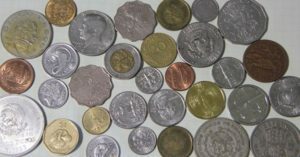 The rest are just interesting to look at and may have a value to a collector, or in some cases, to someone traveling to the country of origin of a coin. Cryptocoins, however, have no intrinsic value as a work of metal art. They are just ledger entries. They don’t know geographic boundaries, though, so they could be used world wide, although government regulations might make them harder (or illegal) to use in some places. I recommend steering clear of any cryptocurrency other than the 4 I mentioned above, at least for now. Most of the wannabe and me-too cryptocurrencies seem to me to be too much like a Ponzi scheme. And even the front runner in terms of press and popularity, Bitcoin classic, has some serious technical problems that limit its transaction rate and keep its cost of transactions high enough that it will probably never be useful as a direct replacement for good old-fashioned national currencies. If you like gambling, cryptocurrency investment should be fun for you. Right now, it seems like it is more about wealth redistribution than wealth creation. The real question I ask is: “Can this be used for good and to advance the Kingdom of God?” I’m sure it can. I don’t love money in any form, but I do want to be found to be a faithful steward of what God supplies for the work He calls us to do. If we keep our priorities straight and seek God’s Kingdom and His righteousness first, then God will supply what we need.